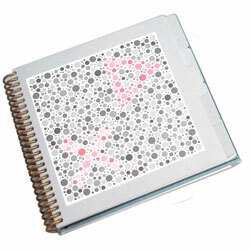 This Hardy, Rand, and Ritter (HRR) Pseudoisochromatic Subset Book for Red / Green test contains two demonstration plates, four screener plates, and 10 diagnostic series for a total of 16 plates. Each of these plates has its own tab for easy and clean page selection. The test also includes a set of instructions in English and a score sheet. The score sheet can then be copied directly onto the patient's record or copies can be made locally. A pad of score sheets is available separately.